There is only one variant known to exist: Brazilian. Translated from Portugese: Could you have even imagined that someday you'd be diving side by side with a pretty mermaid? Then be prepared, for the most incredible adventure under the sea is about to begin. 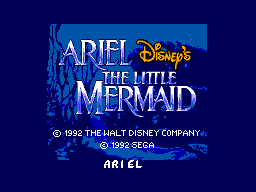 You and Ariel explore the beauty and splendor of the ocean, to save the people of the sea from extinction. Ursula, the horrible witch, wants to conquer the seven seas and imprison King Triton and his subjects, transforming them into octopuses. 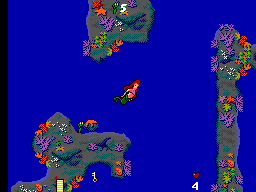 To help them, you and Ariel face terrible challenges in the four phases of this game. 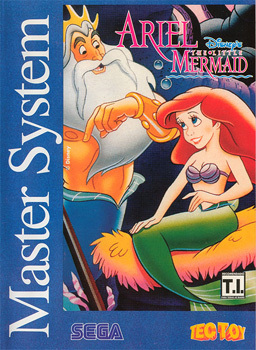 Other than Ursula, you need to face sharks, horrible jellyfish and other monsters. But if you're not frightened, you must go to help. 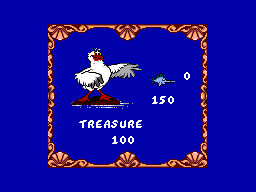 Beyond finding hidden treasures, it's always good to count on the help of Sebastian the crab and Digger the fish. Breathe deep and get ready to go to work. This time, the sea is not only for fish!! !